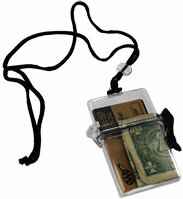 Clear vinyl id holders are an indispensable component of every security program. Available in a variety of sizes. The most common size fits a standard size credit card. They are available in either top loading (vertical) or side loading (horizontal) orientations. 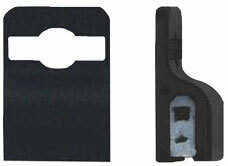 Plastic id badge holders come in a choice of styles as well as attachment options. If you need special or custom size, contact us with your requirements. 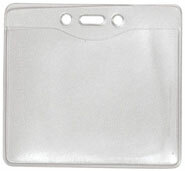 Probably the most ubiquitous of all the plastic id holders being used by company employees is made of clear flexible vinyl. Vinyl id holders are also available with colored bands. Great for coordinating with either company colors or job responsibilities. Versatile holder for slot-free security cards. No holes required, helps prevent damage to the smart chips and circuitry in the badges from slots. Silicone inner core securely holds 1 - 30 Mil card with up to 5 lbs. of force. Opening accommodates lanyards, strap clips and badge reels. Comes in black or white and is customizable on the front. This is your alternative to slot punching! Clear frosted horizontal vinyl badge holder with center slot to accommodate a badge reel or lanyard hook, and 2 holes on each side for a neck chain. 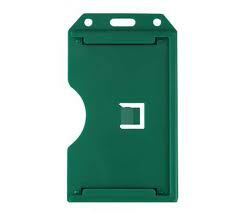 Holds a maximum card size of 3-1/2"x 2-1/2" (credit card size). Holds a maximum card size of 3-3/16"x 3-7/8" (name badge size). Holds a maximum card size of 4"x 3-1/4" (name badge size). Crystal clear horizontal vinyl badge holder with center slot to accommodate a badge reel or lanyard hook. Holds a maximum card size of 4-3/4"x 2-3/4" (custom badge size). Clear frosted vertical vinyl badge holder with center slot to accommodate a badge reel or lanyard hook, and 2 holes on each side for a neck chain. Crystal clear vertical vinyl badge holder with center hole to accommodate a lanyard hook. Holds a maximum card size of 2-3/4"x 4" (custom ID size). Holds a maximum card size of 3"x 4-1/4" (name badge size). Crystal clear vertical vinyl DOUBLE badge holder with center slot to accommodate a badge reel or lanyard hook, and 2 holes on each side for a neck chain. 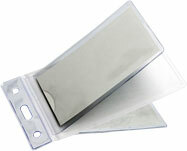 Features a sheilded RFID two card holder to protect card information from unauthorized access. Holds TWO cards with maximum size of 3-1/2"x 2-1/2" (credit card size). Both styles hold a maximum card size of 2-5/8"x 3-5/8" (data/credit card size). Rigid plastic badge holder available vertical or horizontal. One side will hold one 30 mil card. Other side will hold up to three 30 mil cards. Id, business card etc. Both sides hold a maximum card size of 2-5/8"x 3-5/8" (data/credit card size). Colors available: Clear, Black, Blue, Red, Green. WATER RESISTANT ID storage case. Clear durable plastic with rubber gasket and safety clasp closure. Use for cash, ID's, credit cards. Black adjustable bead 36" lanyard. Size: 3-5/8" H x 2-3/8" W x 1/2" D (credit card size).